There are only a few places on Earth like a public men’s room. Its walls enshrine all manner of gastrointestinal pyrotechnics and unnecessary conversation. 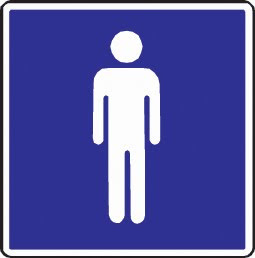 In fact, I believe that a men’s restroom is so far removed from the rest of societal norms that it deserves its own governing set of rules. I have taken the artistic liberty of penning such a list and it appears below. Rule I- No Bodily Function is rude in a Men’s Room. Scenario 1 - Two men are standing in the hall having a conversation. Man A is giving a recap of last night’s football game (or Dancing with the Stars episode depending on your employer) when Man B unexpectedly breaks wind. As the sound reverberates down the hall, Man A glares at Man B and says, “Dude. Not Cool.” Man B hangs his head in shame and is assigned the nickname “Skid Mark” by his fellow co-workers. There is much sadness. Scenario 2- The same two men are in the men’s room off the same hallway as before. Man A is again giving his recap of the previous night’s events when Man B unleashes his flatulence. The two momentarily lock eyes until Man A begins laughing and says, “Dude. Nice one!” Man B shares in this jubilation and is commended by his coworkers for his colonic prowess. There is much rejoicing. Although the elements of both scenarios are identical, the physical location powerfully alters the light in which those elements are viewed. Man B can easily be transformed from a freak to a folk hero simply by practicing his craft inside the confines of a bathroom. I have literally been walking with someone through the hall having a conversation, and as soon as we enter the restroom they immediately produce a sound akin to a small tire exploding. Had they released said pant-load even one foot outside the restroom, it would have been socially unseemly. I have observed this violation of protocol firsthand while at my place of employment. The perpetrator was one of the most feared creatures in a number 2 scenario: a shoe watcher. Shoe watchers have the uncanny ability to identify a stall dweller based solely on their footwear and use this superpower to lure them into unwanted conversations. This particular S.W. would enter the men’s room and say things like, “Hey Brian, how’s it going?” or “Brian, when you finish up I need to ask you something.” It got to the point that I would lift my feet up every time the restroom door opened so as not to compromise my identity. I even toyed with the idea of purchasing a slip-on shoe cover (like the type designed to go over a cast) to throw him off the trail. The urinal area is essential governed by the same ideals as an angled parking space; stay between the lines, stare straight ahead, and it is always illegal to back in. It has also become apparent to me that there is a large percentage of the male population that is unable to utilize a urinal without first spitting into it. Demographically speaking this tends to be more widespread amongst senior citizens, but the younger generation is not immune. While the ritual itself is within tolerable boundaries of men’s room etiquette, I find it puzzling nonetheless. I would also like to stress the importance of proper timing in regards to trouser zippers. Many gentlemen disengage their pant fasteners long before they arrive at the urinal which unnecessarily increases the risk of an “early deployment” scenario. If your fly is so complicated that you must begin extrication proceedings prior to arrival, perhaps you should reconsider your choice in pants. Although there are exceptions to this (hostage situations, Arkansas rest areas after dark) there is generally no excuse for ignoring proper hygiene. It takes all of 25 seconds to moisten your hands with water, apply some soap, and adequately dry them. I may be forced to shake hands with you later, and I do not want the remnants of “Nacho Night” to be a part of that transaction. I have heard of a few people that refuse to participate in this sanitation ritual because they feel that it has been forced upon them by “society” and they feel their adherence to it promotes fear mongering. As infuriating as conscientious abstention can be, fake hand washing is even worse. I have personally observed guys turn on the sink without actually placing their hands under the water. I can only assume that this is to present the idea of sanitation without any of the follow-through. An obvious parallel would be indiscriminately flushing toilets without actually using them.